Four Blood Moons: Something Is About to Change | Say the truth loud! Blood Moon or Red Ruse? It’s been called a rare celestial event that signals the onset of apocalyptic events to occur in the literal nation of Israel. How are we to understand Jesus’ end-time predictions about the heavens? “The sun shall be turned into darkness, and the moon into blood, before the coming of the great and awesome day of the Lord” (Acts 2:20). During the early morning hours of April 15, 2014, the first of four total eclipses of the moon occurred and was visible in the Americas. Astronomers call this a “lunar tetrad” and define it as “four successive total lunar eclipses, with no partial lunar eclipses in between, each of which is separated from the other by six lunar months (six full moons).” When the earth falls directly between the sun and moon, the light from the sun that passes through the earth’s atmosphere creates a coppery-red hue of the moon. Based on a popular but errant view that focuses on the literal nation of Israel, Hagee and author Mark Biltz believe these events are unusual, though many astronomers disagree. Their efforts to line up historical events in Palestine with previous lunar tetrads are shaky. Regardless of these details, the foundations on which their interpretations are based find no basis in the principles of understanding prophecy as outlined in the Bible itself. According to the New Testament, there are two Israels. One group is composed of the literal nation of Israel “according to the flesh” (Romans 9:3, 4) and the other is “spiritual Israel,” composed of anyone who believes in Jesus Christ. Paul writes: “They are not all Israel, which are of Israel” (Romans 9:6). Though it is tantalizing to peer at the Middle East with one finger on a Bible verse, the New Testament writers were very clear about focusing our attention on the new Israel, the body of Christ (see 1 Peter 2:5). Does this mean we ignore this prediction Christ gave regarding His soon coming? Certainly not! We find an outline of sequential events that indeed might have already taken place. “Immediately after the tribulation of those days the sun will be darkened, and the moon will not give its light; the stars will fall from heaven, and the powers of the heavens will be shaken” (Matthew 24:29). Some Bible scholars believe this passage was at least partially fulfilled on May 19, 1780, when a “supernatural darkness” covered certain parts of the United States. 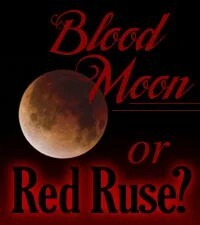 Reports indicated that the moon had the appearance of being red like blood. These events occurred at the end of a great prophetic time period and will occur again in the future (see Revelation 6:12, 13). The phenomena in the sky is not to direct our attention to literal Israel, but to prepare our hearts to become part of spiritual Israel, God’s true people from every nation on earth who are ready for Jesus’ soon return. You can listen to Pastor Doug answer a Bible question about Matthew 24:29 by clicking here.